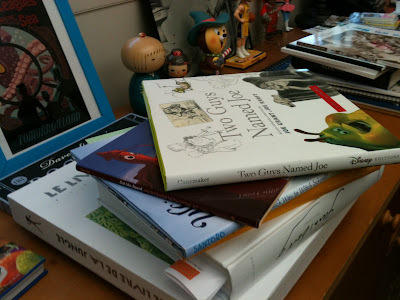 Growing around my desk this past month is a stack of fine new books I've wanted to write about. One by one they arrived, were pored over, enjoyed...and then the struggle began to find the time to do them blog justice. Time: there's the rub. As the days go by this colorful group has migrated around my workspace like Kipling's cannons: looming to the left of me, tipping to the right of me, but never sitting quite where I want them--square in the middle. That position is claimed by a Cintiq tablet. Lately I've found that between work and what time remains to home life the blogging wedge finds a very thin edge indeed. Happily, though, reviewing is a pleasure I still enjoy when possible, and never so much as when writing about new work from talented people. 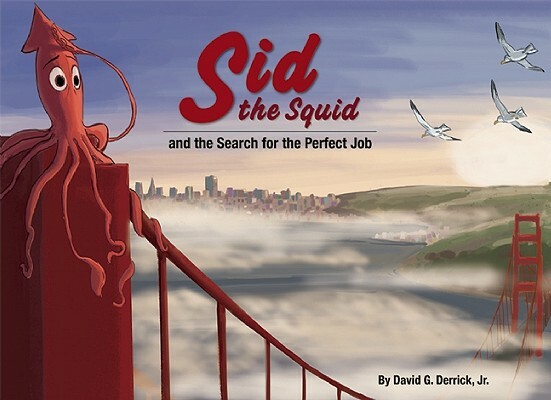 In that spirit I take up the keyboard this week and mark those recent titles, beginning with the first picture book published by my friend David Derrick: Sid the Squid and the Search for the Perfect Job. Dave has been storyboarding, blogging and sculpting constantly in the five years I've known him. He's one of the most energetic and intrepid artists I've ever seen in action, and he's smart enough to play to his interests when planning a project. When he grabs hold of a subject he goes all the way, and one of his fascinations is sea life. 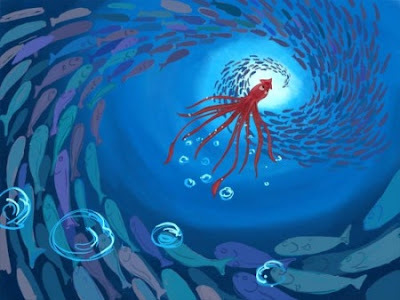 He studies it, photographs it, swims with it and best of all draws it(all these permutations visible on his website), so it's natural that his first stand-alone children's book became a sweet-natured fable about a giant squid. It's a charming, simply written story about an anthropomorphized cephalopod and the little girl who helps him find the best way he can be employed in and around the northern California bay area, winding up at the Monterey Bay Aquarium. Droll adventures ensue. In most picture books it's the 'how' rather than the 'what' that makes it notable. Like virtually all of us in story Dave has been working on a Cintiq for some time and decided it would be interesting to use it for book illustration. While digital, his technique retains a pleasing graphic quality and a neo-impressionistic use of Photoshop paint. As far as Sid himself is concerned, it can't be easy to elicit character from a creature with little more than eyes to act with, but he manages to makes Sid very appealing. My favorite illustration is one of the giant squid dejected after having bombed out of most of his job attempts, spilling over a park bench clutching his appendages to his "chest" like knees. It may be playing a little fast and loose to offer a legendary predator of the deep as an earnest red-orange character putting out fires, washing windows, or rescuing real-life mortal enemies like whales, but conviction can get you places. Dave clearly believes in Sid and his story and he delivers him-and us-to its end safely and sweetly. Nice job. 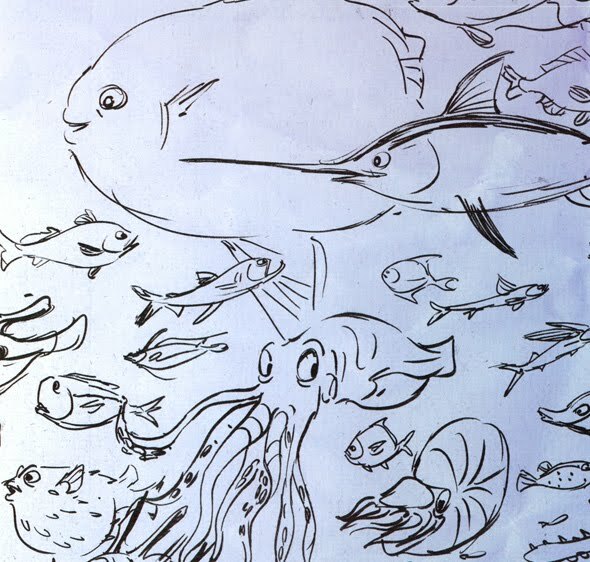 A detail from the endpapers for "Sid the Squid". These deep-sea portraits are among my favorite drawings, and were done in ink. The illustrations proper were all drawn digitally, via Cintiq. Really nice review! Is that P. Lambert book ( in the stack) about The Jungle book?..I heard its great!